Tape isn't dead despite what object store vendors may tell you, and it still plays an important role in both small- and large-scale storage environments. Disk-based object stores certainly have eroded some of the areas where tape has historically been the obvious choice, but in the many circumstances where low latency is not required and high cost cannot be tolerated, tape remains a great option. This post is a technical breakdown of some of the misconceptions surrounding the future of tape in the era of disk-based object stores as expressed in a recent blog post from an object store vendor's chief marketing officer. Please note that the opinions stated below are mine alone and not a reflection of my employer or the organizations and companies mentioned. I also have no direct financial interests in any tape, disk, or object store vendors or technologies. IBM 701 tape drive--what many people picture when they hear about tape-based storage. It's really not still like this, I promise. Scality, and object store software vendor whose product relies on hard disk-based (HDD-based) storage, recently posted a marketing blog post claiming that tape is finally going to die and disk is the way of the future. While I don't often rise to the bait of marketing material, tape takes a lot more flack than it deserves because of how old and of a technology it is. There is no denying that tape is old--it actually precedes the first computers by decades, and digital tape recording goes back to the early 1950s. Like it or not though, tape technology is about as up-to-date as HDD technology (more on this later), and you're likely still using tape on a regular basis whether you like it or not. For example, Google relies on tape to archive your everyday including Gmail because, in terms of cost per bit and power consumption, tape will continue to beat disk for years to come. So in the interests of sticking up for tape for both its good and bad, let's walk through Scality's blog post, authored by their chief of marketing Paul Turner, and tell the other side of the story. Although tape revenue has been decreasing, an increasing amount of data is landing on tape. How can these seemingly contradictory trends be reconciled? The reality is that the tape industry at large is not technologically limited like CPU processors, flash storage, or even spinning disk. Rather, the technology that underlies both the magnetic tape media and the drive heads that read and write this media are actually lifted over from the HDD industry. That is, the hottest tape drives on the market today are using technology that the HDD industry figured out years ago. As such, even if HDD innovation completely halted overnight, the tape industry would still be able to release new products for at least one or two more technology generations. This is all to say that the rate at which new tape technologies reach market are not limited by the rate of innovation in the underlying storage technology. Tape vendors simply lift over HDD innovations into new tape products when it becomes optimally profitable to do so, so declining tape revenues simply means that the cadence of the tape technology refresh will stretch out. While this certainly widens the gap between HDD and tape and suggests a slow down-ramping of tape as a storage media, you cannot simply extrapolate these market trends in tape down to zero. The tape industry simply doesn't work like that. "While this falls short of a definitive end-of-life statement, it certainly casts serious doubt on the product’s future. In fairness, we’ll note that StreamLine is a legacy product family originally designed and built for mainframes. Oracle continues to promote the open LTO tape format, which is supported by products from IBM, HPE, Quantum, and SpectraLogic." To be fair, Mr. Turner deserves credit for pointing out that StorageTek (which was being EOL'ed) and LTO are different tape technologies, and Oracle continues to support LTO. But let's be clear here--the enterprise (aka mainframe) tape market has been roughly only 10% of the global tape market by exabytes shipped, and even then, IBM and Oracle have been the only vendors in this space. Oracle's exit from the enterprise tape market is roughly analogous to Intel recently EOL'ing Itanium with the 9700-series Kittson chips in that a boutique product is being phased out in favor of a product that hits a much wider market. "In its own evaluation of storage trends, including the increasing prevalence of cloud backup and archiving, Network Computing concludes that “…tape finally appears on the way to extinction.” As evidence, they cite the declining price of hard disks,"
Point #1: HDDs include both the media and the drive that reads the media. This makes the performance of HDDs scale a lot more quickly than tape, but it also means HDDs have a price floor of around $40 per device. The cost of the read heads, voice coil, and drive controller are not decreasing. When compared to the tape cartridges of today (whose cost floor is limited by the magnetic tape media itself) or the archival-quality flash of tomorrow (think of how cheaply thumb drives can be manufactured), HDD costs don't scale very well. And while one can envision shipping magnetic disk platters that rely on external drives to drive the cost per bit down, such a solution would look an awful lot like a tape archive. Point #2: The technology that underpins the bit density of hard drives has been rapidly decelerating. The ultra high-density HDDs of today seem to have maxed out at around 1 terabit per square inch using parallel magnetic recording (PMR) technology, so HDD vendors are just cramming more and more platters into individual drives. As an example, Seagate's recently unveiled 12 TB PMR drives contain an astounding eight platters and sixteen drive heads; their previous 10 TB PMR drives contained seven platters, and their 6 TB PMR drives contained five platters. Notice a trend? There are truly new technologies that radically change the cost-per-bit trajectory for hard drives which include shingled magnetic recording (SMR), heat-assisted magnetic recording (HAMR), and bit-patterned media (BPM). However, SMR's severe performance limitations for non-sequential writes make them a harder sell as a wholesale replacement for tape. HAMR and BPM hold much more universal promise, but they simply don't exist as products yet and therefore simply don't compete with tape. Furthermore, considering our previous discussion of how tape technology evolves, the tape industry has the option to adopt these very same technologies to drive down the cost-per-bit of tape by a commensurate amount. "...the ever-greater affordability of cloud storage,"
This is deceptive. The cloud is not a charitable organization; their decreasing costs are a direct reflection of the decreasing cost per bit of media, which are savings that are realized irrespective of whether the media is hosted by a cloud provider or on-premise. To be clear, the big cloud providers are definitely also reducing their costs by improving their efficiencies at scale; however, these savings are transferred to their customers only to the extent that they can be price competitive with each other. My guess, which is admittedly uneducated, is that most of these cost savings are going to shareholders, not customers. "and the fact that cloud is labor-free." Let's be real here--labor is never "free" in the context of data management. It is true that you don't need to pay technicians to swap disks in your datacenter if you have no tape (or no datacenter). However, it's a bit insulting to presume that the only labor done by storage engineers is replacing disks. Storage requires babysitting regardless of if it lives in the cloud or on-premise, and regardless of if it is backed by tape or disk. It needs to be integrated with the rest of a company's infrastructure and operations, and this is where the principal opex of storage should be spent. Any company that is actually having to scale personnel linearly with storage is doing something terribly wrong, and making the choice to migrate to the cloud to save opex is likely putting a band-aid over a much bigger wound. Finally, this cloud-tape argument conflates disk as a technology and cloud as a business model. There's nothing preventing tape from existing in the cloud; in fact, the Oracle Cloud does exactly this and hosts archival data in StorageTek archives at absolute rock-bottom prices--$0.001/GB, which shakes out to $1,000 per month to host a petabyte of archive. Amazon Glacier also offers a tape-like performance and cost balance relative to its disk-based offerings. The fact that you don't have to see the tapes in the cloud doesn't mean they don't exist and aren't providing you value. "...spotlighting a tape deficit that’s even more critical than price: namely, serial--and glacially slow--access to data." This was a convincing argument back in the 1980s, but to be frank, it's really tired at this point. If you are buying tape for low latency, you are doing something wrong. total cost of ownership, which is due in large part to the fact that it does not draw power when data is at rest. there are definitely better options for mass storage than tape. Furthermore, if you need to access any bit of your data at nearline speeds, you should definitely be buying nearline storage media. Tape is absolutely not nearline, and it would just be the wrong tool for the job. Software-as-a-Service providers are known to keep backups of their users' data offline in tape. As mentioned before, this was what saved people's Gmail inboxes when Google's online storage suffered a catastrophic failure caused by a software-based corruption event. At-scale disaster recovery continues to be a case where tape shines. In the fundamental research, we use tape to archive irreproducible experimental data such as telescope observations and particle accelerator measurements. There have been recent cases where ten-year-old telescope images were dug out of archive to prove the existence of exoplanets based on new analysis techniques. In both cases--offline second copy and offline archive--storing data in nearline storage often just doesn't make economic sense since the data is not being frequently accessed. At small scales where the number of cartridges in on the same order as the number of drives (e.g., a single drive with a handful of cartridges), tape is not too difficult to manage. At these scales, such as those which might be found in a small business' IT department, performing offline backups of financials to tape is a lot less expensive than continually buying external USB drives and juggling them. At large scales where the number of cartridges is far larger than the number of drives (e.g., in a data-driven enterprise or large-scale scientific computing complex), tape is also not too difficult to manage. The up-front cost of tape library infrastructure and robotics is amortized by the annual cost of media, and sophisticated data management software (more on this below!) prevents humans from having to juggle tapes manually. At medium scales, tape can be painful. If the cost of libraries and robotics is difficult to justify when compared to the cost of the media (and therefore has a significant impact on the net $/GB of tape), you wind up having to pay people to do the job of robots in managing tapes. This is a dangerous way to operate, as you are tickling the upper limits of how far you can scale people and you have to carefully consider how much runway you've got before you are better off buying robotics, disks, or cloud-based resources. "To access data from a disk-based archive, you simply search the index, click on the object or file you want, and presto, it’s yours. By contrast, pulling a specific file from tape is akin to pulling teeth. First, you physically comb through a pile of cartridges, either at a remote site or by having them trucked to you." The mistake that Mr. Turner makes here is conflating disk media with archival software. Tape archives come with archival software just like disk archives do. For example, HPSS indexes metadata from objects stored on tape in a DB2 database. There's no "pulling teeth" to "identify a cartridge that seems to contain what you're looking for" and no "manually scroll[ing] through to pinpoint and retrieve the data." Data management software systems including HPSS, IBM's Spectrum Protect, Cray's TAS, and SGI's DMF all provide features that can make your tape archive look an awful lot like an object store if you want them. The logical semantics of storing data on disks versus tape are identical--you put some objects into an archive, and you get some objects out later. The only difference is the latency of retrieving data on a tape. That said, these archival software solutions also allow you to use both tape and disk together to ameliorate the latency hit of retrieving warmer data from the archive based on heuristics, data management policies, or manual intervention. In fact, they provide S3 interfaces too, so you can make your tapes and disk-based object stores all look like one archive--imagine that! What this all boils down to is that the perceived usability of tape is a function of the software on top of it, not the fact that it's tape and not disk. "...mountains of historical data are a treasure trove of hidden gems—patterns and trends of purchasing activity, customer preferences, and user behavior that marketing, sales, and product development can use to create smarter strategies and forecasts." "Using disk-based storage, you can retrieve haystacks of core data on-demand, load it into analytic engines, and emerge with proverbial “needles” of undiscovered business insight." Those of us doing statistical analysis on a daily basis keep this xkcd comic taped to our doors and pinned to our cubes. We hear it all the time. This is not to say that the technological sentiment expressed by Mr. Turner is wrong; if you have specific analyses you would like to perform over massive quantities of data on a regular basis, hosting that data in offline tape is a poor idea. But if you plan on storing your large archive on disk because you might want to jump on the machine learning bandwagon someday, realize that you may be trading significant, guaranteed savings on media for a very poorly defined opportunity cost. This tradeoff may be worth the risk in some early-stage, fast-moving startups, but it is unappetizing in more conservative organizations. Compliance: The United States Department of Energy and the National Science Foundation both have very specific guidance regarding the retention and management of data generated during federally funded research. At the same time, extra funding is generally not provided to help support this data management, so eating the total cost of ownership of storing such data on disk over tape can be very difficult to justify when there is no funding to maintain compliance, let alone perform open-ended analytics on such data. Auditing: Keeping second copies of data critical to business continuity is often a basic requirement in demonstrating due diligence. In data-driven companies and enterprises, it can be difficult to rationalize keeping the second archival copy of such data nearline. Again, it comes down to figuring out the total cost of ownership. Cloud providers host user data on disk because they cannot predict when a user may want to look at an e-mail they received in 2008. While it may cost more in media, power, and cooling to keep all users' e-mails nearline, being able to deliver desktop-like latency to users in a scalable way can drive significantly larger returns. The technological details driving this use case have been documented in a fantastic whitepaper from Google. Applying realtime analytics to e-commerce is a massive industry that is only enabled by keeping customer data nearline. Cutting through the buzz and marketing floating surrounding this space, it's pretty darned neat that companies like Amazon, Netflix, and Pandora can actually suggest things to me that I might actually want to buy or consume. These sorts of analytics could not happen if my purchase history was archived to tape. "...Iron Mountain opines that tape is best. This is hardly a surprising conclusion from a provider of offsite tape archive services. It just happens to be incorrect." 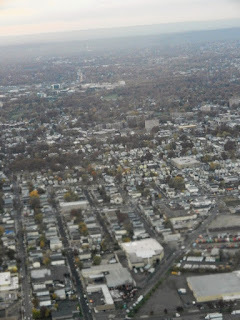 Takeoff from Newark Liberty International Airport--what most people think of New Jersey. It's really not all like this, I promise. I suppose I shouldn't have been surprised that a provider of disk-dependent archival storage should conclude that tape is dead and disks are the future, and I shouldn't have risen to the bait. But, like my home state of New Jersey, tape is a great punching bag for people with a cursory knowledge of it. 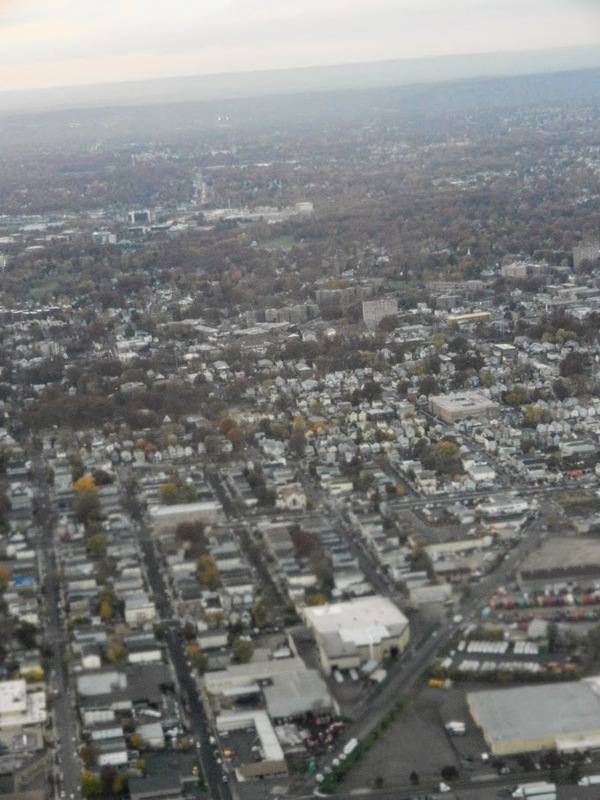 Just like how Newark Airport is what shapes most people's opinions of New Jersey, old images of reel-to-reel PDP-11s and audio cassettes make it easy to trash tape as a digital storage medium. And I just as I will always feel unduly compelled to stick up for my home state, I can't help but fact-check people who want to beat up tape. The reality is that tape really isn't that terrible, and there are plenty of aspects to it that make it a great storage technology. Like everything in computing, understanding its strengths (its really low total cost) and weaknesses (its high access latency) is the best way to figure out if the costs of deploying or maintaining a tape-based archive make it a better alternative to disk-based archives. For very small-scale or large-scale offline data archive, tape can be very cost effective. As the Scality blog points out though, if you're somewhere in between, or if you need low-latency access to all of your data for analytics or serving user data, disk-based object storage may be a better value overall. Many of Mr. Turner's points, if boiled down to their objective kernels, are not wrong. 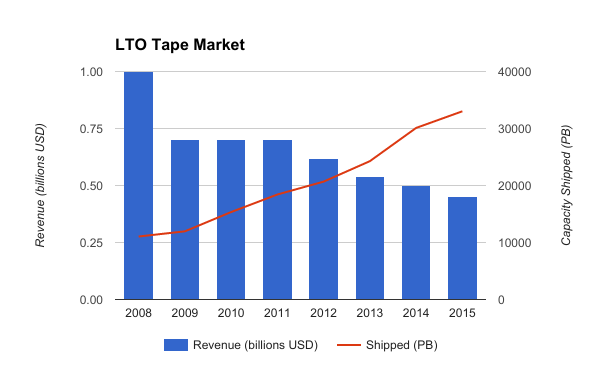 Tape is on a slow decline in terms of revenue, and this may stretch out the cadence of new tape technologies hitting the market. However there will always be a demand for high-endurance, low-cost, offline archive despite however good object stores become, and I have a difficult time envisioning a way in which tape completely implodes in the next ten years. It may be the case that, just like how spinning disk is rapidly disappearing from home PCs, tape may become even more of a boutique technology that primarily exists as the invisible backing store for a cloud-based archival solution. I just don't buy into the doom and gloom, and I'll bet blog posts heralding the doom of tape will keep coming for years to come.